Valentino Rossi concentrates on a new Yamaha MotoGP engine, chassis choice to continue at the upcoming private test at Sepang. Evaluating a new engine was the priority for Valentino Rossi during Wednesday's final day at the Valencia MotoGP test. As such, the Movistar Yamaha rider stuck to the 2016 Yamaha chassis he had switched to on Saturday night of the race weekend. "Today we have to decide and test well some different engine, so we concentrate on that," said Rossi, who was seventh fastest, 0.691s from Honda's Marc Marquez. "Because it’s an important test - and you can't make mistakes - it’s better to have the same bikes to understand the engine. It was a long day, but was positive." The new engine was aimed at providing, "more power without losing the smooth character from the bottom [of the rpm]. "Valencia is not fantastic for testing the engine because it is quite small. But you can understand and we will continue to try it also in Sepang in ten days time." 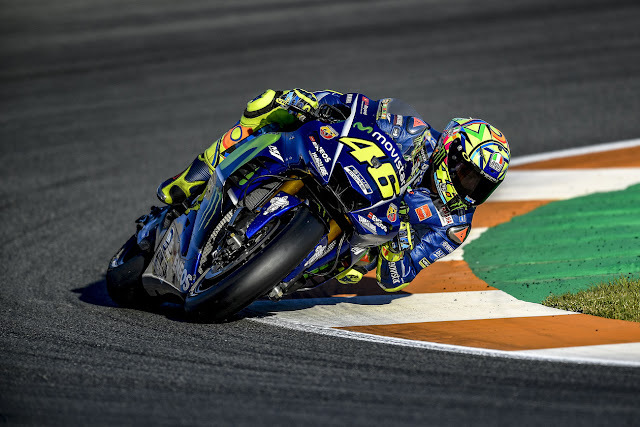 The fact Rossi chose to evaluate the new engine with the 2016 chassis underlined that, like team-mate Maverick Vinales, the Italian favours that frame at the Spanish circuit. But Rossi ruled out the new engine solving the rear-tyre degradation issues, which he feels is the main downside of the 2016 chassis. "No. The engine doesn't help. We need something else." Yamaha's private Sepang test will now be used to make a final decision on the direction of the 2018 machine; engine and chassis. "We will have the same chassis [options] at Sepang as here," Rossi said. "It was already the plan, sincerely. Because the last chassis that we used [the 2018 prototype, which debuted at Silverstone] was prepared for the end of this season, but we decided to use it before." Rossi hopes that the final 2018 Yamaha will then be ready in time for the next official test, to be held at the same Malaysian circuit in late January. "I hope it will be ready because for me Yamaha has to do a long job with the balance of the bike." In other words, the chassis. Valentino Rossi concentrates on a new Yamaha MotoGP engine, chassis choice to continue at upcoming private test at Sepang.